ABOUT THIS INTERVIEW: On January 24th 1964, the Beatles were interviewed for radio by the Armed Forces Network. 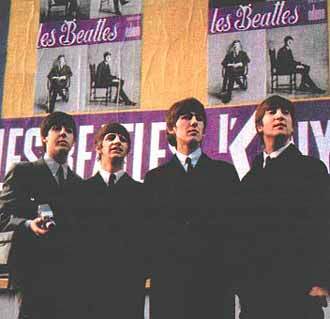 At the time of this interview, the Beatles were in the midst of a 15-day string of performances in Paris, France. AFN correspondent Harold Kelley had the opportunity to speak with the Beatles in an interview that preceded their historic February 9th Ed Sullivan television appearance by 17 days. While the Beatles were a phenomenon in Britain, they were still a very new phenomenon, and their individual names were not yet household words for many people outside of England. Kelley accidentally refers to John as John Lemmon. Among the many points of interest in this interview, Paul talks about the process between himself and John during the songwriting of 'I Want To Hold Your Hand,' George recalls the story of Ed Sullivan's chance brush with the group at London Airport, and John explains Beatlemania by attributing their success to George's dressing gown. The lengthy interview is presented below in its entirety. Following this stay in Paris, the Beatles would fly home to London on February 5th before turning America upside-down with their arrival at John F. Kennedy Airport in New York City on February 7th. Q: "This afternoon in our Paris studios we're visiting with four young men. And if I just mention their first names, such as Paul and George and Ringo and John, I doubt if you'd know about whom we're speaking. But if I said we're here this afternoon with the Beatles, and if we were in England, I think we'd get a great big rousing 'Hurrah!' Wouldn't we, boys?" Q: "Well, let's see. We have to my right here, Paul McCartney. Paul tell us, how did the Beatles get going? How did you start?" PAUL: "It's a funny story, really. (laughs) You know, it was back in the old days. We were all at school together, really, you know. We grew up as school teenage buddies, and things. It developed from there, really." Q: "Well, did you sing together around school, or..?" PAUL: "Yeah. George and I were at school together and John was at the school next door, and Ringo was at Butlins." PAUL: "...and we just started playing guitars, and things. And it went on from there, really, as far as I'm concerned." Q: "Well, you say those were the olden days. Now within the past year, you have mushroomed in tremendously... almost out of sight popularity. What was the click? What levered this great rage for the Beatles?" PAUL: "Well, it's funny really. I think it was the Palladium show, you know, the television show in England. And then following hot in the footsteps we had the Royal Variety Command Variety (clears throat comically) performance." PAUL: "It's difficult to say that, actually. Royal Variety Command Performance for the Queen Mother, you know. And it all came up from there, really. The national newspapers got ahold of it. And they got ahold of Ringo." JOHN: "And Mike Brown found out about it." PAUL: "Mike Brown found out about it. Yeah. A lot of columnists and things got onto the idea and started calling it 'Beatlemania.'" Q: "Lets ask a question here of George Harrison. George, what is the status of Rock & Roll in England today? Is that what you call your music?" GEORGE: "No, not really. We don't like to call it anything. But the critics and the people who write about it, you know, they have to call it something. So they didn't want to say it was Rock & Roll, because Rock's supposed to have gone out about five years ago. And so they decided it wasn't really Rhythm & Blues... so they decided to call it 'The Liverpool Sound' which is stupid, really, because as far as we were concerned it was just, you know, the same as the Rock from five years ago." Q: "Can you describe Liverpool's sound?" GEORGE: "Well, it's more like the old Rock, it's just everything's a bit louder. More bass and bass drum, and everybody sort of sings loud and shouts. (laughs) And that's it!" Q: "Is the Liverpool Sound, then, 'THE' sound in the U.K. today? In England?" GEORGE: "Yeah, well, that's... You know, all the records now... Everybody's sort of making records in that style." Q: "Let's ask Ringo here. Now, you're the drummer. We caught your act at the Olympia the other evening. How long have you been beating those skins?" RINGO: "Oh, about five years now. I've been with the boys about 18 months... with other groups before that. So that's five years." Q: "Since you boys have gained your current popularity, have there been many other organizations trying to imitate you, or perhaps take the thunder away from you? Let's ask John Lemmon this." JOHN: "Well, I suppose, a couple of people have jumped on the... (pause) railway carriage." JOHN: "I mean, the bandwagon. But it doesn't really matter, you know, because it's flattery and it promotes the whole idea of us if we're away, and there's a few little Beatles still going to remind people of us." Q: "Paul, let's go back to you for a moment. Whenever anyone sees your pictures, the first thing that strikes them is, naturally, your hairdo." Q: (laughs) "Or Hair-don't! Some people have written as though you were having the sheepdog cut, or perhaps an early Caeser. What do you call it, and how come you cut it that way?" PAUL: "To us it just sort of seems the natural thing, really, because it all arose... We came out of the swimming baths one day, and you know how your hair, sort of, flops about after the swimming baths. Well, it stayed that way, you see, when nobody bothered to comb it. And it sort of stayed in a style. So we've never really called it anything, I don't know, until the papers got ahold of it, and they called it the Beatle style. So I suppose we go along with them now, really." Q: "Do you go to the barber at all?" PAUL: "Well, you know, now and then. Do and don't." Q: "Just to keep it trimmed." PAUL: "Yeah. Just to keep it trimmed. But sometimes we do it ourselves, you know." PAUL: "The other thing is, its really only our eyebrows that are growing upwards." Q: "We've been told that in England today there's this 'Beatlemania' going on. What would you say Beatlemania is? That all the girls scream when they see you, and perhaps faint waiting in line. Let's be immodest a moment. What is the attraction?" GEORGE: (laughs) "I don't know." JOHN: "I think it's that dressing gown." JOHN: "George's dressing gown is definitely a big attraction." PAUL: "No, I don't think any of us really know what it is. We've been asked this question an awful lot of times, but we've never been able to come up with an answer yet, because I think it's a collection of so many different things, like, happening to be there at the right time, at the right moment. (sings) 'But the wrong face.'" PAUL: "No but... A little bit of originality in the songs, a little bit of a different sound. I don't know. It's an awful lot of things. Maybe the gimmick of the haircut, as well. The luck getting into the national press at the right time. It's an awful lot of luck." JOHN: (deep, comical voice) "It's all these things and more!" Q: "Well, you mentioned songs. I understand you boys write your own material." PAUL: "John and I write them. This is Paul speaking. John and I write." Q: "Paul, yes. How do you think up an idea? Do you get together regularly, or an idea pops in your mind and you say 'Let's sit down and do it'? PAUL: "Umm, if an idea does pop in your mind, then you do sit down and say 'Let's do it,' yeah. But if there's no ideas, and say we've been told we've got a recording date in about two days time, then you have got to sit down and sort of slog it out. But you normally get, first of all, just a little idea which doesn't seem bad. And you go on, and then it builds up from that. It varies every time though, really." Q: "Paul, we've seen you here at the Olympia. Can you compare the French audience with what you're familiar with back in England?" PAUL: "Well, there's a lot of difference, because in England the audiences are seventy-five percent female. Here, seventy-five percent male. And that's the main difference, really. Because they still appreciate it, but you don't get the full noise and the atmosphere of a place." Q: "No screams and fainting. Why is it seventy-five percent boys?" GEORGE: "I don't know, but I think they don't let the girls out (laughs) at night." JOHN: "I think it's your dressing gown." GEORGE: "Somebody said that they still have to have chaperones, a lot of them, you see. Whereas in England their out. It's funny. It's the same in Germany, all the boys like the Rock, and it's usually the same on the continent. I don't really know why." Q: "'I Want To Hold Your Hand' is #1 on the Hit Parade, and we have a copy of it here right now, so let's sit back for a moment and listen to it." Q: "How did you come to write that, 'I Want To Hold Your Hand'?" PAUL: "This was one of those songs we were told we definitely had to get down to it. We had to get working. So we went and we found an old disused house. We were sort of walking along one day. We just thought 'We've got to really get this song going.' So we got down in the basement of this disused house, and there was an old piano there. It wasn't really disused. It was, sort of, rooms to let. We found this old piano and we started banging away there." JOHN: "And I played organ." PAUL: "Yeah. There was a little old organ there too. So we were just having this sort of informal jam session down there. And we started banging away, and suddenly just a little bit came to us. I think it was just the catch line. And so we started working on it from there. We got our pens and paper out, and we just wrote the lyrics down. And uhh, eventually you know, we had some sort of a song. So we went back and we played it to our recording manager, and he seemed to like it. So we recorded it the next day." Q: "Do all your songs have a basic theme or story or message?" PAUL: (laughing) "That was a quick answer!" PAUL: "They don't, but there's one thing that nearly always seems to run through our songs. People always point it out to us. That's the 'I' and 'You' and 'me' always seems to be in the title. You know... 'I' want to hold 'YOUR' hand, She loves 'YOU,' Love 'ME' do, and things like this. Well, I think the reason for that really is that we nearly always try and write songs which are a little bit more personal than others, you see. So by having these prepositions, whatever you call them, I and ME and You in the titles, it makes the songs a little bit more personal. I think that's the only sort of basic message that does run through our songs." Q: Now, you coined this 'Yeah, yeah, yeah!' Isn't that really sweeping England right now?" JOHN: "Yeah. Well, that was sort of the main catch phrase from 'She Loves You.' But we stuck that on... We'd written the song nearly, and we suddenly needed more, so we had 'Yeah, yeah, yeah.' And it caught on, you know. They use it for... If you're gonna be 'with it' or 'hip.'" Q: "It's sort of a trademark for you boys now." Q: "Paul, what do you think of your trip to the States? I understand in about a week or ten days you're going to be on the Ed Sullivan show. Could you tell us about it?" PAUL: "Yeah, that's right. We're gonna do Ed Sullivan's show in New York. And we're taping one for later release, I think. And we're looking forward to those, and then we go down to Florida, Miami... Can't wait! And we do another Ed Sullivan there, but I think before that we do Carnegie Hall, don't we?" Q: "How were you selected for Ed Sullivan? Was he in England and caught your act or something?" GEORGE: "When we were flying back... this is the story we heard... we were arriving from Stockholm into London Airport, and at the same time the Prime Minister and the Queen Mother were also flying out, but the airport was just overrun with teenagers. There was thousands of them waiting for us to get back. And Ed Sullivan was supposed to have arrived at that time and wondered what was going on, and you know, he found out it was us arriving. And also our manager went over to the States with another singer called Billy J. Kramer, and he did a couple of TV shows over there. And while he was over there, our manager got the bookings with Ed Sullivan. But he'd also heard of us from this London Airport thing. And that's about it." Q: "And how about a movie? Is there a movie in the future?" PAUL: "Mmm, yeah. We've been asked by United Artists to do a feature movie." Q: "Will it be dramatic, or just strictly wrap around your singing?" PAUL: "Oh, we don't know yet, really, what it's going to be like. I don't think we'll have to do an awful lot of acting. I think it'll be written 'round the sort of people that we are, and there'll be four characters in it very like us." Q: "Do you plan to compose two or three songs specifically for the film?" PAUL: "Actually, we've got to compose six songs specifically for the film. We've got to get down to that, too. That's a job." Q: "And you boys really haven't had much of a chance to see Paris, have you?" Q: "What do you think of it so far?" GEORGE: "Well, it's nice. Quite nice." Q: "How about the French girls compared to the British girls?" RINGO: "Oh, we havn't seen any yet!" JOHN: "Yeah well, I'm married so I didn't notice 'em." Q: "We'll go back to Paul, then." PAUL: "I think they're great." PAUL: "Yeah. I think the French girls are fabulous." GEORGE: "But we have seen more French boys than French girls. So I mean, you know, we can't really tell." Q: "Well, perhaps when you get to the Ed Sullivan show there will be more girls for you." Q: "Any of you been to America before?" GEORGE: "Yeah, me. I went in September just for a holiday for three weeks." Q: "Just George Harrison. Well, I see our time is up, boys. Thank you very much, Beatles, for being our guest on AFN this afternoon on Weekend World."